Home » Email vendor Selection Articles » OMG your RFP is killing me! 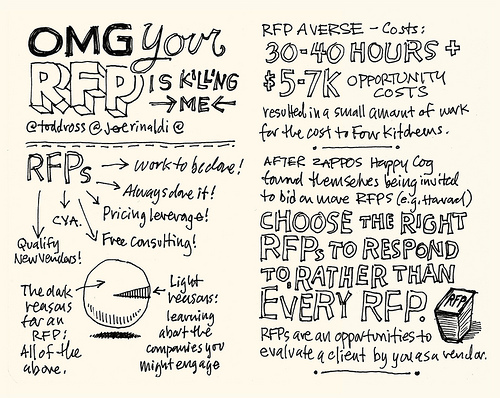 OMG your RFP is killing me! What is the nature of RFPs and how to do them best? 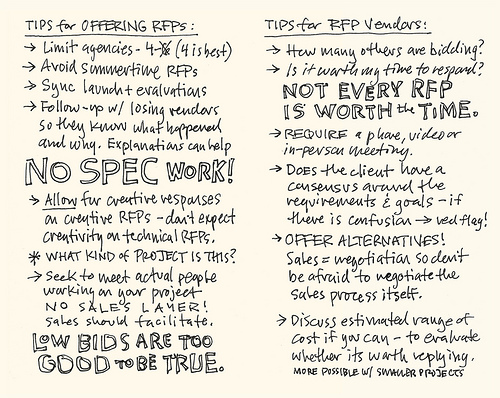 My friend Mike Rohde had the pleasure to attend the SXSW conference this year and created some brilliant sketchnotes on the topic of how to deal with Requests for proposals. There are some great takeaways for when you are running your own RFP for email software selection and for more creative email marketing agencies. Follow up with the losing vendors so they know what happend and why . Explanations help. Try and meet the actual team on the service provider side that will be working on your (email marketing and implementation projects. The vendors sales people can facilitate, but meet the real people. And lastly: When a bid is too good to be true, it usually is. Great points to take away and as always very nicely sketchnoted by Mike, check his stream of of other sketchnotes here or subscribe to his newsletter.